We can’t live without it...so what should we do about it? Several events – dramatic events for the most part – prompted this post. The first was super storm Sandy. As someone who did not live through this, I can only react to the amazing images of destruction and sounds of suffering. But, I was struck once again by the impact of being without power. We simply cannot live without it, other than for perhaps a couple of days. (My family has lost power for 4 days twice as a result of hurricanes, and, no matter how much of a game you try to make of it, it gets tiring very quickly). Without power in today’s society you don’t seem to be able to do very much at all, including things you may not expect. For example, there were long gas lines in the New York metro area, resulting from a variety of factors, including the inability to get gas delivered, as well as the inability to pump it in stations that had gas but no power. This issue is brought to dramatic life by the TV series Revolution. While the main concept may be a bit stretched – the world loses all power including the power of internal combustion engines – the show dramatizes the effective collapse of society when the power fails to return. I thought about the importance of electricity and power in our society from a much pleasanter vantage point last month: on board a beautiful ship, watching the total solar eclipse of the sun in the South Pacific. For those who have never experienced a total eclipse, it is really hard to do justice to a description; it really is an amazing event. This was a first experience for my wife and me; but as we learned quickly, for some of the eclipse chasers on the ship this was experience number 16. The eclipse totally blotted out the sun – making it colder and darker and reminding me how critical this source of power is, and what we would lose if this power source got snuffed out. Okay, we would lose everything, so this is not a direct analogy, but the eclipse also reminded me of the potential role of the sun in power production – and how much more is needed to leverage that power on a global scale. This blackout, of course, only last 3 minutes — not 3 days or weeks. The sun produces 174 petawatts of power, of which over half gets absorbed by the earth. A petawatt is 1quadrillion watts, a tough number to get your head around. The energy from the sun warms the air, which then evaporates water from the oceans and generates atmospheric circulation. 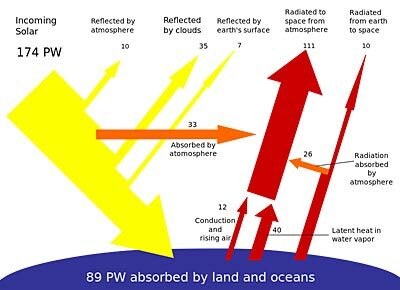 When the air reaches an altitude where the temperature is lower, water vapor condenses into clouds, which rain onto the Earth’s surface, completing the water cycle. The heat released from water condensing amplifies convection, producing atmospheric phenomena such as wind – and cyclones. Via photosynthesis, green plants convert solar energy into chemical energy, which produces food, wood and, ultimately, fossil fuels. To put this level of power production in perspective, the earth absorbs more energy from the sun in 1 hour than the population of the earth uses in 1 year. In other words, the sun theoretically has the potential to meet all of our energy needs. Currently, it is used directly to produce only a small fraction of the power generated in the world. The good news is that it is starting to be leveraged more effectively. 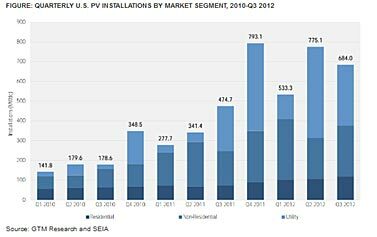 A recent study by GTM research reports that the US is going to deploy 1.2GW (a gigawatt is one billion watts; long way to go to get to a petawatt) of solar power in the 4th quarter of 2012, bringing total installation for the year to 3.2GW for the year, headed to 3.9M next year, and 8 GW by 2016. While this remains a small percentage of electricity use in the US – estimated at about 4% – and an even smaller percentage of the sun’s power, it represents a sizeable and growing trend. A lot has been made of the failure of some well-known solar companies over the past year or so. What is rarely mentioned is the cause of some of those failures – the rapid reduction in the cost of PV and other solar technologies, brought about by innovation and competition. While this is bad news for the companies affected, it is very good news for consumers and businesses, who have seen the cost of system installations plummet. While we are not yet at “grid parity” (the point at which solar can compete with traditional fuels for electricity generation) in most electricity markets, we are getting very close in some areas. And these cost reductions are helping many companies in the solar industry; witness the recent IPO for solar leasing pioneer Solar City. Further research and support of the solar industry can get us there, and enable us to do a much better job at leveraging the vast power of the sun to power the world. Of course, to get solar power to this point there are still a lot of hurdles to address other than cost alone – such as the need for effective storage for when the sun is not shining. And, solar power will not solve the problem of power grid disruptions caused by massive storms. But, it should, and could play a much broader role in our energy policy and directions over the coming year. Please do not read anything into the fact that this was posted on 12-21-12.